On 26 July 2012, His Holiness Patriarch Kirill of Moscow and All Russia arrived in the capital of Ukraine and proceeded to the Holy Assumption Laura of the Caves in Kiev. He was met at the Near Caves by His Beatitude Metropolitan Vladimir of Kiev and All Ukraine and brethren of the monastery. A regular session of the Holy Synod of the Russian Orthodox Church chaired by His Holiness Patriarch Kirill began. His beatitude Metropolitan Vladimir of Kiev and All Ukraine; Metropolitan Vladimir of St. Petersburg and Ladoga; Metropolitan Philaret of Minsk and Slutsk, Patriarchal Exarch of All Belarus; Metropolitan Juvenaly of Krutitsy and Kolomna; Metropolitan Vladimir of Kishinev and All Moldova; Metropolitan Varsonofiy of Saransk and Mordovia, chancellor of the Moscow Patriarchate; and Metropolitan Hilarion of Volokolamsk, chairman of the Moscow Patriarchate’s Department for External Church Relations, are permanent members of the Holy Synod. Metropolitan Alexander of Astana and Kazakhstan and Metropolitan Vikentiy of Tashkent and Uzbekistan were included as permanent members by the decision of the Holy Synod by its decision of 5 October 2011 (minutes 99) pending approval of the Bishops’ Council. 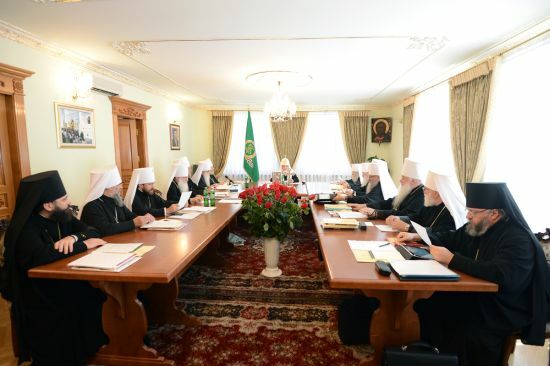 Metropoliut5an Nifon of Lutsk and Volyn, Metropolitan Nikon of Ufa and Sterlitamak, Metropolitan Pavel of Ryazan and Mikhailov, Bishop Tikhon of Maikop and Adygea, and Bishop Aristarkh of Kemerovo and Novokuznetsk were invited to take part in the spring and summer session of 2012. “Your Beatitude! Your Eminences and Your Graces! Dear members of the Holy Synod! We are opening the Synod’s session within the historical walls of the Laura of the Caves on the eve of the commemoration day of the Holy Prince Vladimir, Equal-to-the-Apostles. It has become a tradition. We are happy that an important session of the Holy Synod will be held in proximity to the holy relics resting in the holy Laura. We are to discuss a number of important questions. The first and foremost is the convening of the Bishops’ Council of the Russian Orthodox Church. The second is the information received from New York concerning the death of the Imperial Family. I believe this information will help us outline our position, including that concerning the so called the Yekaterinburg remains. I will present proper materials to you; we shall discuss them and take acceptable decisions.